What barriers exist in Colorado that might be preventing individuals who are eligible for Medicaid or private insurance through Connect for Health Colorado from enrolling in health insurance? How can Colorado strengthen its outreach and enrollment efforts? As part of the implementation of the Affordable Care Act, Colorado has expanded Medicaid and also now operates its own health insurance exchange for individuals (called Connect for Health Colorado). As of early 2014, more than 300,000 Coloradans have newly enrolled in Medicaid or health insurance through Connect for Health Colorado, but there also continues to be a diverse mix of individuals in Colorado who remain eligible for but not enrolled in either private insurance or Medicaid. The Colorado Health Foundation commissioned the RAND Corporation to conduct a study to better understand why these individuals are not enrolled in health insurance coverage and to develop recommendations for how Colorado can strengthen its outreach and enrollment efforts during the next open enrollment period, which starts in November 2014. RAND conducted focus groups with uninsured and newly insured individuals across the state and interviews with local stakeholders responsible for enrollment efforts in their regions. The authors identified 11 commonly cited barriers, as well as several that were specific to certain regions or populations (such as young adults and seasonal workers). Collectively, these barriers point to a set of four priority recommendations that stakeholders in Colorado may wish to consider: (1) Support and expand localized outreach and tailored messaging; (2) Strengthen marketing and messaging to be clear, focused on health benefits of insurance (rather than politics and mandates), and actionable; (3) Improve the clarity and transparency of insurance and health care costs and enrollment procedures, and (4) Revisit the two-stage enrollment process and improve Connect for Health Colorado website navigation and technical support. There is significant confusion and little understanding about Medicaid and private insurance subsidies through Connect for Health Colorado. Messaging about insurance was not compelling and did not discuss the health benefits of insurance. There are not enough funds or data to support local outreach and education. Many Coloradans have unfavorable attitudes toward the individual mandate. There is significant mistrust of the system. Messaging was often not tailored or actionable. Health insurance coverage is not affordable for many Coloradans. The complexity of plan materials makes plan selection difficult. There were lag times and poor communication about eligibility-related decisions. There was misinformation across stakeholders. Individuals in Colorado must apply for Medicaid and be denied before applying for private insurance. The Connect for Health Colorado website was not user-friendly. Support and expanding localized outreach and tailored messaging. Strengthen marketing and messaging to be (1) clear, (2) actionable, and (3) focused on the health benefits of insurance (to overcome negative or politicized messaging consumers are hearing). Improve the clarity and transparency of insurance and health care costs and enrollment procedures. Revisit the two-stage enrollment process and improve Connect for Health Colorado website navigation and technical support. This research was sponsored by the Colorado Health Foundation and conducted within RAND Health. 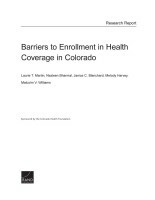 Martin, Laurie T., Nazleen Bharmal, Janice C. Blanchard, Melody Harvey, and Malcolm V. Williams, Barriers to Enrollment in Health Coverage in Colorado. Santa Monica, CA: RAND Corporation, 2014. https://www.rand.org/pubs/research_reports/RR782.html.